Systematic and reliable motion system embedded with strong mechanical framework and accurate servomotor control technology to deliver superb output quality under rapid movement. A Closed-loop DC servo motor can deliver greater continuous shaft power at higher speeds than a stepper of the same frame size. In addition, It can also give far greater accuracy due to the continuous movement, instead of constant stopping and starting. GCC LaserPro high speed closed-loop DC servo motor technology guarantees precise and fast carriage movement with exceptionally accurate outputs. The super user-friendly SmartCENTER™ function helps end users to easily and automatically locate the center point of objects of any shape vastly eliminating tedious setup time. 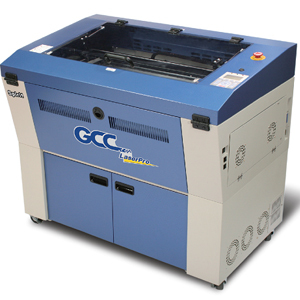 GCC LaserPro integrates laser firing control and image processing technology to create a 3D engraving function, the laser system assigns up to different laser powers to 200 levels of grayscale in the image to make the spectular 3D effects with different slopes. Patented TrueImage feature smoothes the image engraving edge automatically by employing a unique laser firing algorithm to present image engraving in its most vivid form. Rigid and stable chassis construction ensures consistent output quality under high speed movement. Easy-to-use multiple position modes allow the operators an effortless way to setup a job with Drag-N- Play. Repetitive workflows can be drastically simplified by relocating the origin position to any desired location. Built-in LED light module illuminates the working space and makes every engraving detail easy to see. Convenient front and rear door open design enables loading of extremely long working pieces with ease and extends business flexibility. Extra large working area extendable to 38" x 24" (960 x 610 mm). The spacious platform allows jobs that require large working space. Directly output from familiar designing software like Illustrator, CorelDraw, AutoCad through GCC LaserPro Windows driver. The innovative driver featuring powerful functions, such as SmartCENTER, Air Assit by Pen, Defous by Pen, Bridge Cutting, Drill, Dithering Patterns and more to reduce set up time and make easy adjustments to achieve marvelous output quality. Quality-Speed-Mode technology redefines the correlation between speed and quality allows generation of marvelous engraving quality while racing at high speeds. *Throughput value represents the Max. number of 8 in. x 10 in. 500DPI raster jobs that can be done per hour. *The flow rate is determined by a default fume extraction system; the flow rate may vary due to a di fferent fume extraction system. ?